So you’re not headed to Disneyland or another state for some quality family time this year. Like most families, you may have the financial burden of taking one. Hence, a family camping trip doesn’t seem like a pretty bad option. 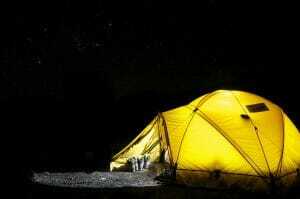 Considering the pleasant climate and cold winds around this time of year, it is perhaps the best time to go camping. Whether you’re going with family friends or just your family alone, a camping trip is a good way to spend time together. The first thing you want to do is to reserve a camping site for you and your family and whoever is going with you. This is important because although you can, by definition, “camp” anywhere, you want to make sure you choose a site that’s in the woods and yet not so in as to put your family in the territory of night creatures (yikes!). To do this, you may want to research a little bit on what you want the reserve to provide you. Some reserves aren’t much of an experience away from home considering there are stalls around you and the only difference about this experience is you sleeping in a sleeping bag. Not quite the experience you had in mind, did you? For this very reason, it’s always best to envision the trip in your head and decide on what you want yours to look like. Once you’ve decided what kind of trip you want this to be you need to start making the arrangements. Call the reserve and ask them for a slot and all possible details on discounts, offers and any essential information you may need. This will help you prepare and pack for the trip. In case you are unsure about what to pack and what to do, you can always ask your agent at the reserve by contacting them. It’s also helpful if you look into more than one reserve sites to explore all options. Make a list of all the things that you would need on this trip. When contacting the firm at the reserve, the person attending your call may have given you a few suggestions on what you must bring to the reserve with you. Note these down and make a list of all the things you would need during this time with your family. Now that you’ve made a list, you want to make sure you’ve packed everything you need. Remember, this is important because no one wants to make a visit to a nearby shop in the middle of their camping trip. Ensure that once you’re at the reserve, you won’t leave until your trip is over. This will ensure that you make the most out of your trip. You may need to rush to a nearby store to stock up on a few things when you’re packing and that’s alright. Remember, the point is to keep it simple and keep it real. One essential for this trip is a portable toilet. Unlike your regular toilet, the waste from a portable toilet is led to a carrying tank, and well, keeping you from going to the bushes at oddly hours of the night. Now that you’ve made the arrangements and are pretty much set, you want to read a bit about the activities you want to do when you go there. Fishing and mountain hiking being very common, popular activities amongst a plethora of camping activities. Now that you’re all set, don’t forget to sit by the campfire and spend quality time with your family. After all, that’s what you all came for.